I have no interest in the news. Me, a former journalist. Me, a former news junkie. Me, who had RSS feeds from the major news sources coming into my every electronic orifice. Because most of the news is what it is – journalistic chaff. Reportage roughage. Informational dietary fibre. There are important breaking news stories of course – and informed well researched commentaries – but mostly, the news is not important. Not in the whole scheme of things. I went five weeks without looking at a news site on the web. That's the longest period in my adult life when I've gone without the news. And I didn't miss it one dot. When, post Camino, I finally did check in, nothing much had changed. There were some scandals at home involving a couple of high profile people, which the country seemed absorbed in, while I was walking across Spain blissfully unaware. I don't feel my life was any the poorer for not knowing the details of these scandals. On the contrary, the Camino showed me how facile and totally unimportant it all is. If I saw The News walking down the street coming towards me, I'd cross the road to avoid it. Because I'd know that The News would want to grab me by the lapels and shout at me about all the horrible things that have happened lately, or it would want to gossip, or it would want to pull down the reputations of good people I admire. It would be full of negativity and idle meaningless chatter. And it would try to pander to my basest fears. Fear of my personal safety, fear of people of different races, fear of change. The News would try and rattle me. It would try to make me angry. Try to make me hate. So I figure The News would be someone to avoid. That's what I'm doing Post-Camino. 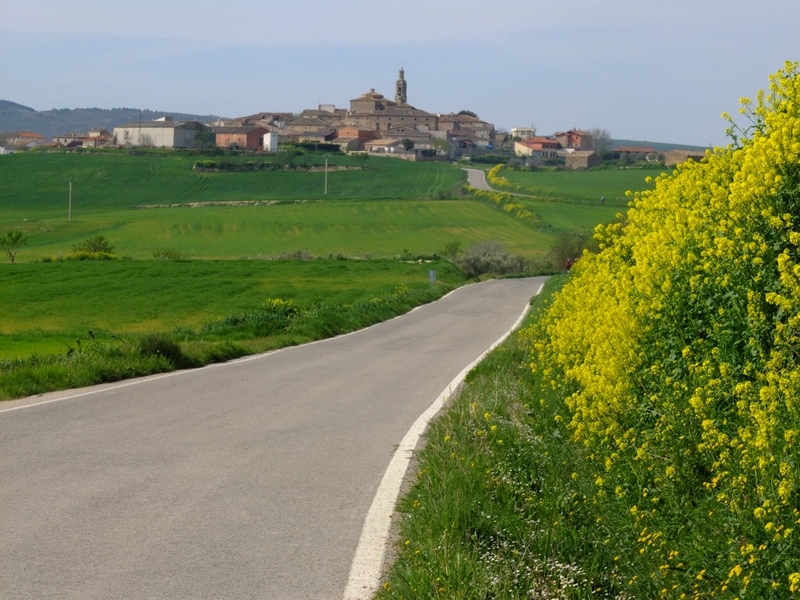 This entry was posted in Post Camino by Bill Bennett. Bookmark the permalink. Ah Bill, yes and yes and yes. Day 3 I lost my watch… I am convinced the Camino took it.. I didn’t need it and to this day, I still am not wearing one. I believe the second week in, when I finally got on FB and asked what day it was… people thought I had gone crazy.. but truly I had no idea, and at that time I still felt more comfortable asking friends then fellow pilgrims. They told me Friday, and I thanked them kindly, because that mend that the next day I was going to stock up on food for Sunday,a lesson I learned during my first week. I remember the first hotel I slept in, in Viana, I turned on the TV and the person that had occupied the room prior to me had it set to CNN Europe… oh boy did I turn it off quickly and never watched TV again. Like yourself, I did not want to hear about any of the things going on in the “real world”. It’s like jumping into ice cold water, numbing. Maybe that is why so many of us just don’t want to let go of the Camino magic. Keep crossing the road, safely. Thanks Ingrid. – yes, and funny about the watch. I had a watch all the time, but seriously lost track of the days! The Camino really has made you see life differently, hasn’t it. Life must be more serene, you have a better understanding of what’s important. Serene is a good word for it Rose, yes. I have to keep ahold of this though as I re-enter work mode. That’s going to be the test. But if I keep reminding myself that I’m a pilgrim, as corny as that might sound, then that will hopefully help me. I hate to be manipulated by the media. One can clearly see their agenda. I feel hostage of the cable provider. I will cancel it after I retire at the end of this year! I stop wearing a watch long time ago. I have an internal clock, works pretty good. iPhone works for reminders. I get there when I arrive and I leave when I am done. I envy you that – to live without a watch. In your first posts…I could sense in your writing a tension, the words were tight there was a resistance.. I first noticed the change on the day you walked 41km….there was a lightness in your words and your joy beamed through…. Over the next few weeks that settled into a easy style…as it appeared you were unravelling your thoughts….understanding why you felt certain ways……and then an acceptance. Now as you reflect…..and as I read these recent posts…I find your words and thoughts seem to be free…there is such an easy flow….like their is a connectedness between each thought. All your post to me have been wonderful to read. I still feel very privileged to have found your blog…and to be sharing in this wonderful experience with you. Dear Abbey, you have been an important mirror for me, to use to reflect upon, and to allow myself to see shifts and changes that I would otherwise have overlooked, or that have been so gradual that I would have otherwise been unaware of them. I think you are absolutely right in what you say, and I think it’s very perceptive of you. You are obviously someone who understands the subtleties of language, and you can read subtext. Interestingly, I was sitting at a dinner with a group of pilgrims one night in an albergue – about 16-18 days into the walk. A bloke sitting opposite me turned out to be someone I’d met briefly on my first day. I’d stopped at Valcarlos for a coffee. (The Route Napoleon was closed due to snow.) We spoke briefly. He was stopping in Valcarlos, and I was going on to Roncesvalles. He noted at that dinner that I was an entirely different person to the one he’d met that first day. He said I’d been jumpy, agitated, on edge. He said now I was relaxed, and appeared happy. I laughed, and told him that yes, I was very anxious that first day. And if I was to be honest, I was probably a little scared too. I had built up this climb up the Pyrenees to be something quite daunting. Also, I pointed out that I was jet lagged. I had literally flown in from Australia the previous afternoon – 40 hrs travel – and had been awake since 2:30am that morning. That was no doubt affecting my mood too. But his words came as a shock to me, because of course we believe we are in a state of permanence – that it’s not possible to make fundamental shifts in two or three weeks. But, the Camino does that. It FORCES that upon you. What I also find interesting is how my photos changed over the course of the Camino. In many ways they also reflect my transformation. The early shots are wide, largely unfocused, (by that I mean, there’s not a key central subject), they are taken in a hurry, without a great deal of thought or consideration. That begins to change after Burgos, once I moved onto the Meseta. The photos start to have meaning and resonance. I began to stop, and really look around me. This I think culminated in that stretch around Samos, where because of my photography it took me five hours to walk 11 kms. I couldn’t walk 100m without stopping and taking another shot. But my pictures from that stretch are amongst my favourites. I’m going to post a blog later today, talking more about this, and about breaking old habits – but I’d just like to thank you for being so frank with me with your observations, not only in your comment here, but previously as well. As I say, you have been an important trigger for me to look at the whole Camino experience in a more reflective way. I’m really enjoying your blog and your posts on the Camino forum. Your observations about the news really hit home with me. While never a news junkie I watched the evening news, local and national, most days. However, when the last Bush was President I found myself getting so angry and frustrated while watching, the news. Me who is a pacifist, wanted very often to reach through the screen and just slap the smirk off his silly face. I didn’t like how I was feeling, thinking and all the negativity that was bombarding me each day. So I gave it up. I figured if something was really important I’d hear about it. Haven’t missed it a bit. My life and I are a lot calmer. I don’t walk until fall 2014, 456 days from now, but who’s counting! the fall of 2014 will come up surprisingly fast! And you’re fortunate that you have all that time in between to properly prepare yourself, physically and emotionally. I think walking in the fall, with all the trees in colour, would be so so beautiful. As for the news, yep, it’s funny how for those of us now who have “crossed the street,” our internal antenna somehow seems to pick up what’s important and relevant.